An incident in the life of Ampère? In fact, electrodynamics truly occupied all of Ampère's thinking for only a few months from September 1820 to January 1821. A pulmonary attack initially prevented him from continuing this work, then family, health, and professional problems combined to make his research much more discontinuous. The young André-Marie, born in 1775, essentially was educated by his family, with in addition a series of private lessons in mathematics. His education was marked by a great diversity of subjects reflecting his wide interests: ancient literature, poetry, the search for a universal language, botany, astronomy, mathematics, physical sciences, the construction of instruments and technical apparatus... It was for mathematics that he showed the clearest predisposition, as a teenager mastering the essentials of the mathematics of his era. Leaving his village of Poleymieux in 1797 to earn a living in Lyons, the young man set up a small laboratory at home and gave private lessons in mathematics, physics, and chemistry. Starting in 1801, motivated by the announcement of Napoleon's grand prize on galvanism following Volta's discovery of the electric battery (the "Voltaic pile"), Ampère worked on electricity, even starting to write a book on the subject. But, he rapidly abandoned physics for mathematics. In 1804, he was appointed as a teaching assistant ("répétiteur") in analysis at the Ecole Polytechnique, and it was thanks to his mathematical work on the theory of games that he entered the Academy of Sciences in 1814. Nonetheless, although he became a mathematician, his interest was at least as great for questions of chemistry, but also philosophical, metaphysical, and religious questions. In fact, the only research that occupied his mind practically without interruption from 1802 until his death in 1836 was the quest for a classification of the sciences. Ampère sought to capture the unity and the basis of all human knowledge. Passing from one subject to another, he aimed at understanding each science's methods and its relationship to other sciences. Between 1809 and 1814, prior to his electrodynamics work, Ampère was fascinated by chemistry, by psychology, and by the debate that stirred the Academy of Sciences over Fresnel's new theory of light. He became an ardent defender of Fresnel's wave theory of light against the Newtonian corpuscular theory. In short, in 1820, Ampère was a mathematician who wanted to make a name for himself as a philosopher and whose most important work doubtlessly was in chemistry! In 1820, when Oersted's memoir on "electrical conflict" reached Geneva [See the page L'expérience de Hans-Christian Oersted], the physicist Gaspard de la Rive quickly reproduced the Danish savant's experiments thanks to his particularly powerful battery. A metallic wire placed over a compass needle made the needle deviate from its north-south orientation when the wire was connected to the battery's two poles. The conducting wire was placed on top of the compass in the direction north-south (NS). When the wire was connected to a battery, the compass was deflected. The movement was indicated by the arrows and the new position by a dashed line. The reader is tempted immediately to interpret this as meaning "when the wire is carrying a current," but the "electrical conflict" to which Oersted attributed the magnetic effect had little to do with the modern concept of electric current. As we shall see below, it is precisely from Oersted's experiment that Ampère was led to define "electric current" as a circulation of electrical fluid(s) in a closed circuit. So, there was a direct relationship between electricity and magnetism. This link was sought out by Oersted who, sensitive to the "romantic" vision of nature then predominant in Germanic countries, long had maintained the unity of physical phenomena. He even had argued the idea that electricity was at the heart of this unity. But in Paris, mathematicians and physicists such as Laplace, Poisson, or Biot were convinced of the complete independence between electricity and magnetism. Certainly Coulomb had shown that electrical and magnetic forces followed laws identical to that of Newton for gravity, these three forces decreasing as the inverse square of the distance. But, there was hardly more reason to believe in a connection between electricity and magnetism than to believe in a magnetic attraction between the Earth and the Moon. Moreover, the revolving character of the observed effect was astonishing. Newtonian forces acting between masses, between electrical charges, or between magnetic poles, are directed along a straight line joining the interacting elements. Oersted's experiment did not fit into this framework. If one overcame the magnetic effect of the Earth on the needle, as Ampère soon would achieve, the needle actually turned to be perpendicular to the wire, as if it were driven by a vortex turning around the wire. The vortices that Oersted evoked harkened back to those that Descartes claimed to explain celestial motions, and these seemed to be a step backward to outdated science. Rare were those physicists who accepted Oersted's vortex explanation. Oersted's experiment: "an important occurrence in my life"
What is this "grand theory" about which Ampère wrote? It was the unification of two fields of physics by reducing all magnetic phenomena to purely electric phenomena. 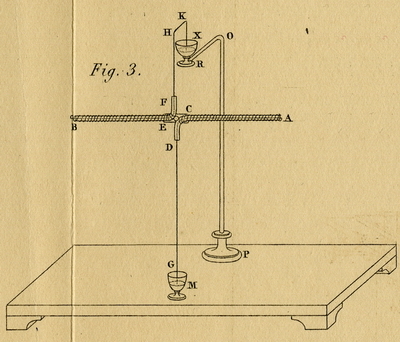 These electric phenomena - interactions between currents - were exhibited by Ampère for the first time in the continuation of his work on Oersted's experiment and were radically new. 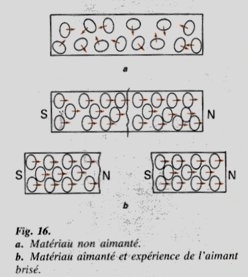 Magnetic fluids for Ampère became a "gratuitous assumption" that one could eliminate from the field of science. The prevailing feeling among most other French savants was that, with the theories of Newton and Coulomb, physics became a nearly finished edifice, a "science erected, stable, and impossible to reverse," as Biot wrote in 1824. For them, the natural process was to bring the unknown - Oersted's experiment - into the known, that is to say, as properties of magnetic fluids. Biot therefore proposed to reduce the interaction between the conducting wire and the compass to purely magnetic interactions based on the principle according to which only similar entities can interact. If the conducting wire acted like a magnetic needle, it is because it temporarily became a magnet. We will take up the points enumerated by Ampère, but without going in strictly chronological order. Indeed, historians struggle to reconstruct the genesis of Ampère's theory, examining read and unpublished memoirs, undated manuscripts, results of experiments "guessed" before being obtained, and texts revised between their presentation to the Academy and their publication. In his summary publications, especially in his first Mémoire [...] sur les effets des courants électriques [Memoir . . . on the effects of electric currents], Ampère stated that his objective was to present his experiments and reflections following "the order that suits the methodical exposition of the facts" which erased the tracks of the actual process of creation. Ampère's first thought was that, in Oersted's experiments, the action exerted by the current "combines with that which the terrestrial globe exerts on the magnetic needle." If there were no terrestrial magnetism, he assumed, the action of the current would orient the needle perpendicular to the wire. 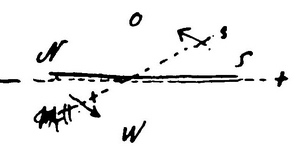 To overcome the action of terrestrial magnetism, he imagined a compass (see the figure) whose axis of rotation was in the direction of the terrestrial magnetism. The needle, always perpendicular to the direction of the terrestrial magnetism, remained in balance regardless of its position: it was "astatic." One placed the conducting wire parallel to the plane in which the needle moved by attaching it to the small glass rods GH and IK. When current flowed through this wire, the graduated circle allowed one to measure the angle between the wire and the needle. Even before the instrument was built, Ampère announced that this angle would be 90 degrees! "There lacked an instrument to make known the presence of a current in a battery or a conductor, which would indicate its energy and direction. his instrument exists today; [...] an apparatus similar to a compass, and which differs from it only by the use made of it [...]. I think [that] one should give it the name galvanometer." What Ampère here designates as the "energy" of the current is called a few pages later its "intensity" : "the electric current exists everywhere [in a circuit] with the same intensity." But, the definition of current intensity as a flow of electricity remained implicit. Also, Ampère was a bit hasty when he gave the name "galvanometer" to what was just the concept of the instrument. In the manuscript of his memoir he called it more appropriately a "galvanoscope". Indeed, to turn it into a measuring instrument, it was still necessary to know how to take into account the effect of terrestrial magnetism acting on the compass. That is what the Italian physicist Leopoldo Nobili did a few years later. "If one mentally stands in the direction of the current in such a way that it flows from the feet to the head of the observer, and one's face is turned toward the needle, it is always to one's left that the action of the current will divert [the north pole of the needle] from its normal position." 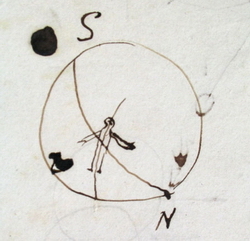 Ampère drew his "observer" for the case of electric currents that he imagined inside the terrestrial globe. The circle represents the Earth with its magnetic poles N(orth) and S(outh) connected by a terrestrial meridian. The observer is traversed from foot to head by an electric current (partially shown) circulating around the equator. One must imagine the observer lying on his back on the ground and watching a compass located above him. His left arm indicates the direction that will be taken by the North pole of the compass under the action of the current, that is to say the N(orth) pole of Earth. Ampère's "little guy" (le "bonhomme d'Ampère") has incited generations of French lycée students to all sorts of contortions, at least mentally, and at times stimulated their humorous wit. The 1820 definition of current intensity as a flow of electricity might suggest that Ampère adhered to the idea of a movement of electricity in the conductor. He wondered, however, according to a view similar to that of Oersted, if there were not instead a gradual propagation step by step of a sort of polarization of the particles of the conductor. On the other hand, the question of the cause of the currents remained open. 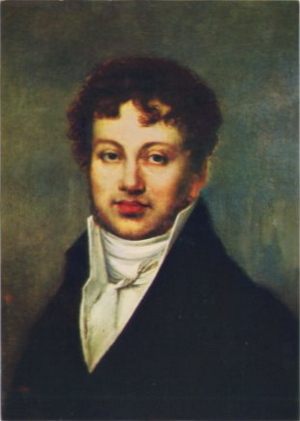 As for the battery, Ampère took up Volta's erroneous thesis according to which the electromotive action was due to the simple contact of two different metals, but he noted the inadequacy of this hypothesis when it came to explaining the currents responsible for terrestrial magnetism. Ohm's famous law, E = IR [U = RI in French], has accustomed us to the idea that the tension E applied to a conductor with resistance R is the source of the current with intensity I flowing through the conductor. But, for Ampère, the notions of tension and current were incompatible. 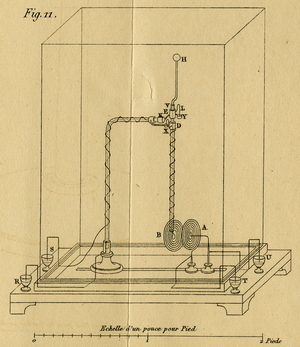 This error, which persisted until the work of Ohm, rested on a simple experimental observation well known since 1800: when the ends of a battery are joined by a "connecting wire," an electrometer connected to one pole of the battery will register no longer any deviation. On the other hand, one can observe in the wire the effects of a strong current caused by what is called today a short circuit [Watch the video La pile de Volta en court-circuit ]. "The electromotive force manifests itself through two types of effects[...] I will call the first electric tension ("tension électrique"), the second electric current ("courant électrique"). The first is observed when the bodies between which the electromotive action takes place are separated from each other by non-conducting bodies." In the first case, the electromotive action, whether from a friction machine or a battery, is the cause of the separation of the positive and negative electricities. One then observes the effects of electricity of tension: the attraction of light bodies, sparks, or deflections of the electroscope. "The second [effect] is that when [these two bodies] in contrast form part of a circuit with conducting bodies."... Thus "there is no more electric tension, light bodies are no longer attracted, and the ordinary electrometer can no longer serve to indicate what is happening in the body." The electromotive action engenders in this second case "a double current, one positive electricity, the other negative electricity." One then observes the effects of current electricity, and notably the magnetic effects revealed by Oersted's experiment. The (erroneous) assertion according to which, in this case, "there is no more electric tension," later will be tempered. Ampère would write that the electric tensions "disappear or at least become very small." Other questions on which Ampère reflected: how was a constant current established? Why did the "electromotive action" not accelerate the electric fluids indefinitely? Could a battery maintain the movement of these fluids indefinitely? If the question of the nature and causes of the current thus remained largely unresolved, this did not at all prevent his studying its effects. 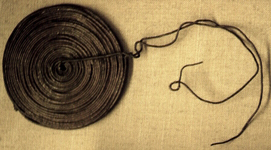 "Galvanic spirals and helices produce the same effects as magnets"
Announced on 18 September, Ampère presented his "decisive" experiment to the Academy during its meeting of 25 September: two conducting wires wound in spirals attracted or repelled each other when they were traversed by a current, depending on the direction of current, exactly as would two poles of a magnet. 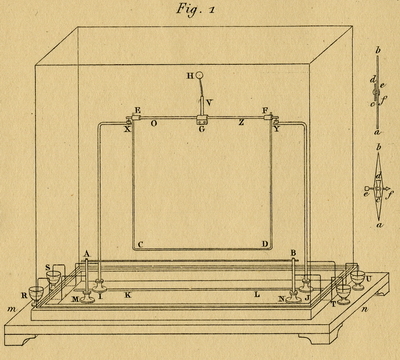 To make this experiment succeed, at first attempted with too weak batteries, Ampère had to purchase the large battery intended for the physics course of the Paris Faculty of Sciences. He showed that one could substitute the pole of a magnet for one of the spirals. In every case the attractions and repulsions showed that one of the faces of the spiral acted like the South pole of a magnet, the other like a North pole. [Watch the video, Aimants et courants, quelques expériences inspirées d'Ampère ]. The analogy between circular currents and magnets was even more striking when a little later Ampère replaced the spiral with a "solenoid," a term Ampère invented to designate a helical coil. The 25 September meeting has been portrayed as being historic. In what way was the experiment of the two spirals, to use Ampère's words, "the decisive experiment that I had conceived as a definitive proof"...? To his eyes this experiment constituted the proof of his "grand theory": if the spirals acted like magnets, it was because magnets owe their magnetism to "electric currents in planes perpendicular to their axes." "The way in which I conceive magnets"
"[There are] on the surface and in the interior of a magnet as many electric currents in planes perpendicular to the axis of this magnet that one can imagine a series of lines forming closed curves [inside the magnet] without cutting across each other." When Ampère expressed himself this way he seemed to believe in the existence of macroscopic electric currents to the point of speculating on the origin of the "electromotive action" in the magnetic material that engendered them. But, starting on 15 January 1821, moved by a suggestion by Fresnel, he presented another hypothesis, that of currents around elemental particles ["courants particulaires"]. Each particle of the magnet would be surrounded by a circular current around an axis parallel to that of the magnet. Ampère did not wish to decide between these two equivalent hypotheses, although various theoretical and experimental arguments lead him to give preference to the hypothesis of microscopic currents which also matched well with his atomistic beliefs in chemistry. In this diagram from a book written with Jacques Babinet, the arrows represent the direction that the macroscopic currents should have inside a magnet whose pole located at A is a South pole, and that located at B is a North pole. What does today's science say? While modern theories that account for magnetization are extremely complex, they confirm in their own way the existence of circular microscopic currents that today we still call "amperian currents." In the atom, each electron has a property called its spin that corresponds in classical physics to a rotation about its own axis. For there to be magnetization, the electron spins must be in parallel with one another. 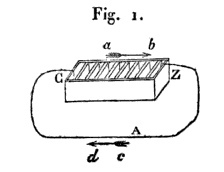 As Ampère already noted, the existence of loops of current throughout the material of the magnet, and not just in the vicinity of the poles, allows us to understand the famous experiment of the broken magnet (see figure to the right). "Similar currents as I acknowledge [are] in the Earth"
The Earth acting on the compass like a magnet, there must be currents circulating in it, according to Ampère. The cause of these currents can be only conjectured, but the properties of terrestrial magnetism seem to agree with the idea of circular currents. The terrestrial magnetic field is very similar to that which would be produced by a magnetized bar whose axis is angled slightly from the polar axis. Macroscopic currents, nearly equatorial, are at the origin of the magnetic field. The "dynamo" effect that generates these currents within the Earth and most of the stars currently is an important subject of study. Ampère stated on 25 September that all magnetic phenomena, whether produced by magnets, currents, or the Earth, could be explained by a general law according to which two parallel currents flowing in the same direction attract each other, while two currents running in opposite directions repel each other. On 9 October he performed an experiment before the Academy that verified this fundamental law. To reveal the relatively weak forces that act between two portions of a conductor, Ampère imagined the apparatus shown to the right. The movable conducting wire CD, which is acted upon by the fixed conductor AB, is part of the framework CDEF that can pivot about the axis XY. The insulator piece EF rests at X and Y on fine points in small cups filled with mercury that allow, regardless of the tilt of the framework, the flow of current in the conducting circuit XCDY. The counterweight GH attached to the framework makes it possible to raise the center of gravity, so that a weak force exerted on CD will translate into a sufficiently large angle. This experiment is fundamental for Ampère's theory. It is for him the purest manifestation of the effects produced by electricity in motion. But, this interaction between currents was not understood as such by his audience. It looked too much like a new version of the usual electrical attractions. Also, Ampère had to emphasize an essential difference: while similarly electrified bodies repel each other, similar currents (flowing in the same direction) attract each other. In addition, the conductor connected to the battery's terminals did not carry a discernible charge. In order to support the fundamental character of the interaction between electrical currents even in purely magnetic phenomena, Ampère resorted to an interesting argument about the historicity of the construction of scientific knowledge. "The order in which one discovers facts has nothing to do with their reality in nature", he argued [Ampère to Simon Speyert van der Eyk, 1821]. If the deflecting action of a current on a compass, discovered by Oersted, had been known before the magnetic action of the Earth, one naturally would have "concluded that the cause was the same, and that there also was a galvanic current around the Earth...". Similarly, if the action of an electric current on a magnetized needle had been discovered before the action of a magnet on the same needle, one would have been led to consider the latter as acting like a collection of currents. The "fundamental fact" of course is the mutual action between two currents. But, for a mathematician like Ampère, explanation assumes not staying with the qualitative aspects of this action. One also must provide a mathematical law. In order to be able to calculate this fundamental interaction between two electric currents, the natural approach for Ampère, a professor of analysis, consisted of mentally cutting each conductor into an infinity of small rectilinear elements. If one knows the force acting between two infinitesimal current elements, the interactions between electric circuits of different shapes, and therefore the interactions between circuits and magnets or between magnets, can be deduced by integration. It was to the search for this basic elemental formula that Ampère thus attached great importance. He made a rough draft of this formula as early as the end of October 1820. It seemed self-evident to him that the elemental force must obey the Newtonian principle of action and reaction and therefore be directed along the line that joins the two current elements. Ampère additionally assumed it to be proportional, like the gravitational force, to the inverse of the square of the distance. But, unlike gravitational force, the force between any two current elements depends on their relative orientation, which is defined by three angles. During the following months, Ampère will search for the mathematical expression of this force as a function of the distance and these angles. The "electrodynamic formula" that he proposed initially included an unspecified factor. The difficulty is extreme. The infinitesimal current elements are in effect a mathematical idealization, and experiments always entail macroscopic circuits. In fact, while it is always possible, at least theoretically, to deduce from an infinitesimal force, by integration, the force exerted between macroscopic circuits, going in reverse from the experimentally observed forces between portions of macroscopic circuits to an elementary law is rather complex. This will be Ampère's work over several years [See the page In Search of a Newtonian Law of Electrodynamics], a work often interrupted by illness and professional problems, and whose outcome will be the grand synthesis of 1826, the Mémoire sur la théorie mathématique des phénomènes électrodynamiques uniquement déduite de l'expérience [Memoir on the Mathematical Theory of Electrodynamic Phenomena Deduced Solely from Experiment]. Ampère, André-Marie. Mémoire [...] sur les effets des courants électriques, Annales de chimie et de physique, 1820, vol. 15, p. 59-75, p. 170-218. Ampère, André-Marie. Recueil d'observations électrodynamiques, Paris, 1822. Ampère, André-Marie. Théorie [mathématique] des phénomènes électrodynamiques, uniquement déduite de l'expérience, Paris, 1826. A bibliography of "secondary sources" about the History of Electricity.